"Food and Wellbeing between past, present and future" organized within the partnership of the Association with the IRI research company. 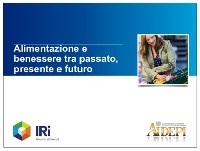 April 18th, 2018 a meeting took place in Milan at the IRI headquarters in Via dei Missaglia 97, for the AIDEPI Associates only, to present the research entitled "Food and Wellbeing between past, present and future" organized within the partnership of the Association with the IRI research company. 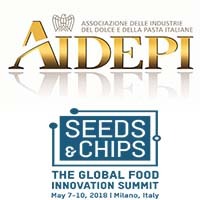 In the current month of March a new partnership between AIDEPI and the organization "SEEDS & CHIPS - The Global Food Innovation Summit" has been launched. A collaboration agreement was signed, for the duration of the next event, which will take place in Milan, at the MICO (Milan Congress) on 7-10 May 2018. 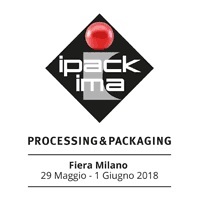 The AIDEPI will participate in the IPACK-IMA 2018 edition, as part of the partnership between the Association and this Organization. The event will take place at the Fiera Milano Rho exhibition center, from Tuesday 29 May to Friday 1 June 2018. Every 25th October World Pasta Day is celebrating annually since 1998. The 2017 edition is organized by ABIMAPI (Associação Brasileira das Indústrias de Biscoitos, Massas Alimentícias and Pães & Bolos Industrializados) in collaboration with the International Pasta Organization (IPO).